In Pensacola Beach, the Coast Guard braces for a Category-5 hurricane that has entered the Gulf of Mexico. During a routine patrol of the waterways, the aircrew spots a massive fishing cooler floating a mile offshore. The guards suspect that the icebox contains smuggled drugs, but when they open it, they’re shocked. It is filled with body parts. Criminal profiler Maggie O’Dell is sent to investigate as the rest of Florida holds its breath for the storm’s impending arrival. Eventually, Maggie is able to trace the torso in the cooler back to a man who mysteriously disappeared weeks earlier after a hurricane hit Port St. Lucie, on the Atlantic side of Florida. How, then, did his body end up six hundred miles away in the Gulf of Mexico? 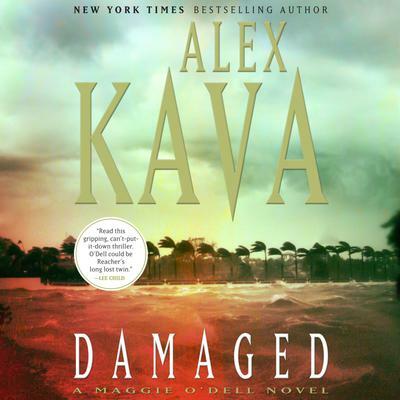 Cliffhanger chapters, behind-the-scenes forensic details, colorful characters, and satisfying twists have become the trademarks of Alex Kava’s psychological thrillers. In Damaged she ratchets up the suspense by sending Maggie into the eye of a monster storm to track down a killer.